When we were first driving from Dublin to our farm house, we couldn't help but notice this very tall, perfectly cone shaped mountain about 15 minutes before arriving to Louisburgh. We had asked the family who own the farm house what the name of the mountain was, and they told us that it is Croagh Patrick, a very famous mountain, and they explained some of the history. 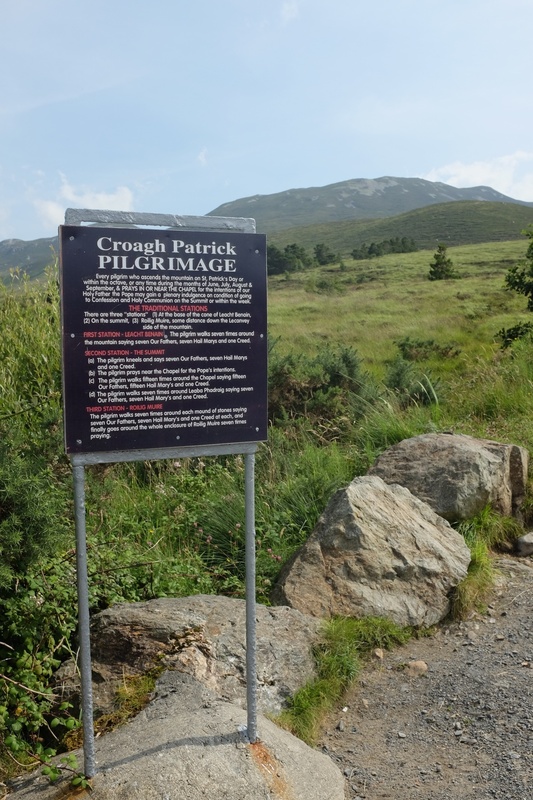 This coming Sunday, the last sunday in July, is the annual Croagh Patrick Pilgrimage, in which over 25,000 pilgrims descend on the nearby town of Murrisk and climb to the top of of the mountain. We've been wanting to climb the mountain since we first got here, but we didn't really want to do it when it's so busy, so we decided to hike the mountain today since the weather was nice and warm. 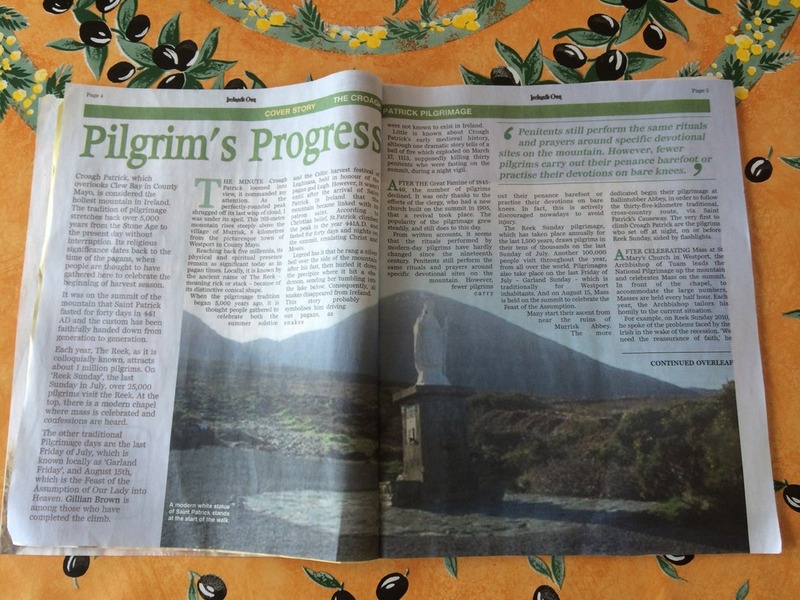 For those wanting to know more about the history, as it's really rather interesting, here's an article from this months edition of "Ireland's Own" on the history and tradition of the Croagh Patrick pilgrimage. We drove into town, parked at the local car park, and began our trip. We were greeted early on by some signs explaining the pilgrimage and a statue of Saint Patrick. With the mountain in the distance, we set off! Even with pictures, it's hard to see how difficult of a hike this is. To get to the peak, you have to first climb a long, windy path all the way up a first mountain, before looping around and going the rest of the way up the main Croagh Patrick peak. It is a very rocky and steep path in parts, and we witnessed quite a few spills. The way up was a loooong process, especially with two little kids. There were a lot of people on the path, going in both directions, which made the atmosphere fun and full of energy, but occasionally difficult to navigate. We were glad we packed our little first aid kit, not for our own family thankfully, but early on there was a woman who had fallen and cut open her knee, and we were able to provide Neosporin and bandaids to our fellow hiker. Thankfully that was the worst of the injuries we saw. On a side note, one of our new friends, Mike (Ciara's dad) is on the mountain rescue squad. They have to deal with a lot of injuries on the mountain, especially on the Sunday pilgrimage, and to get injured people down they either have to airlift them via helicopter (if the weather is good), or more likely (when the weather is bad) need to have about 6 to people carry them down on a stretcher. One of the many breaks. Just a little left to the top of this mountain! This is as high as we made it. It was about an hour or so left, and apparently at the end it is VERY steep, so probably for the best we turned around. As we continued our climb, we started to realize we were not going to make it all the way to the top. Both kids were doing all their own walking, and they were getting very tired, especially Hannah. We set a goal to make it to the top of the first mountain, where it flattens out before looping around and continuing to the main mountain. At long last, we made it to our goal, and were rewarded with spectacular views of Clew Bay. In all, it took about 2 hours, with multiple short rests and a small lunch break on the way. As high as we made it. Clew Bay is below, with some of the 365 islands visible. The way down was much faster, but not much easier. Since it was so rocky, it meant lots of slipping and sliding. Most of the falls we witnessed were people on the way down, so we were being very careful. We held both kids hands the whole way, and while Kian was able to keep his balance and had a lot of fun, Hannah was a bit wobbly and had to be carried in some parts. And were well rewarded with ice cream from the welcome center! After finishing the hike, we made our way over to Andrea's house for another playdate with Ciara and Roisin, and met their dad Mike. They have a very nice house with lots of fun toys and a dog, including some of the same awesome Ikea toys our kids have, so the kids were all having a blast and didn't want to leave. Hannah and Ciara were especially good together, and went off playing together like little girls do. After leaving, we went to a local restaurant in Louisburgh, called A. Gaffney. This restaurant is owned by the family of the people we met at Carrowmore beach the other day, and so they had recommended it to us. It was a nice restaurant with very yummy seafood, and was a great way to end this fun and action packed day.